In the National Geographic Channel’s, WICKED TUNA, follow the lives of the FV-TUNA.COM crew and other commercial bluefin tuna fishermen of Gloucester, MA. Over 100 giant tuna hooked and 88 jumbos landed in 2016. Our new, fast, spacious and comfortable 44’ by 18′ Downeast charter fishing boat is noticeably a cut above the rest. Captain Dave and crew are dedicated to providing top quality service, equipment and results for our guests. The FV-TUNA.COM offers Gloucester Deep Sea Fishing Charters for Cod & Haddock, Striped Bass & Blues, and Giant & School Bluefin Tuna. Regulations have changed and so we our currently focusing on haddock fishing versus cod and the fishing has been fantastic. Leave the dock with a grin from ear to ear and a bag full of unbelievably fresh fish to melt the hearts of your family and friends. Have you ever dreamed of catching big striped bass or reeling in a feisty bluefish? We will get you on the keepers in short order and leave you with unforgettable memories of the one that didn’t get away. 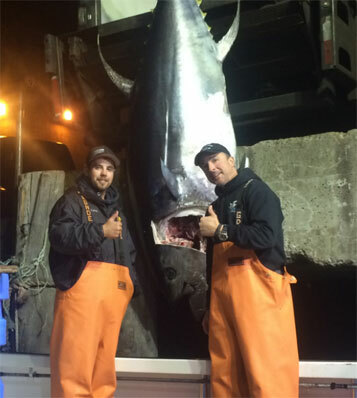 As one of the top tuna charter boats on Wicked Tuna, experience a once in a lifetime opportunity to watch the big rods bend and the line scream off the massive reels with one of the most famous tuna fisherman in the world. The FV-TUNA.COM is available for Marathon-Day, Full-Day, Half-Day, Multi-Day Fishing Charters for 1 to 6 people. Click here for more information on Charter Pricing. For our Tuna and Cod Fishing fanatics coming from New York, New Jersey, Connecticut and New Hampshire Charter Boat Fishing with us for the first time we recommend staying dockside at the Cape Ann Resort and Marina, which offers a 10% discount for our guests, two great restaurant’s with bar and a 30 second walk to meet your crew. Gloucester MA is the perfect choice for your New England Fishing Charter due to it’s close proximity to some of the most productive fishing grounds in New England. A short ride to the fishing grounds means more time for your Gloucester charter fishing experience! The fishing vessel is Captained by Dave Carraro who holds a U.S.C.G. 100-ton Masters License and has an invaluable 38 years experience with Gloucester Fishing Charters. 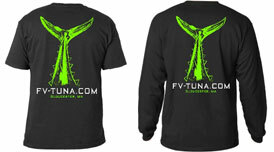 To learn more about Dave and FV-TUNA.COM Fishing Charters, visit our about us page or Facebook.